By anyone’s standards Pericles, Prince of Tyre is an obscure Shakespearean play; even in a large class for an MA in Shakespeare Studies, it would not raise any eyebrows to declare “I have never seen Pericles before”, the way it might with something like Hamlet, or Romeo and Juliet. It is performed infrequently by the RSC, the Globe and the National, and often not on the main-house stages of the respective theatres. (Shortly after writing this sentence, the National Theatre announced a new season, including a production of Pericles in the Olivier Theatre - however, it seems to be in a more musical version aimed primarily at younger audiences.) It’s a problematic play for many reasons: the surviving text is rife with issues; the play was excluded from the First Folio (and thus had some difficulty being inducted into “The Canon”); the play is visibly co-authored and, unlike many other instances of Shakespearean collaboration, the text’s composition was divided distinctly in two parts, so that Shakespeare wrote the final three acts and his collaborator – now generally accepted to be George Wilkins – wrote the first two. George Wilkins’ unsavoury reputation hasn’t helped the play either, especially amongst those who deify Shakespeare and consider such collaboration beneath The Great Genius; similarly, as the play is regarded as out-of-fashion for its time, and not of the highest artistic quality, many have argued historically (and, in some pockets, contemporarily) that Shakespeare The Great Genius could not possibly have created such a work. The structure of the play, its episodic nature, its seeming archaisms, its uncertain genre as mostly a romance and/or tragicomedy, its geographic and chronological and narrative sprawl – all of these set Pericles aside from Shakespeare’s canon, with perhaps a single clear exception: The Winter’s Tale. In 2017, Cheek By Jowl toured a powerful production of The Winter’s Tale, visually bold and beautifully performed, with a lacklustre (but pertinent) fourth act being the sole let-down of a superlative production. Their focus was largely on the psychodrama that binds Leontes, Hermione, Mamillius and, eventually, certainly, Perdita – the drama and trauma of abandonment and neglect. Leontes clings to his queen like one who cannot bear to be shunned, even in his imagination, and acts petty, childlike, behaviour replicated in Mamillius’ behaviour as father teaches son and cycles of abuse and trauma perpetuate. Here trauma is a force that can make and break not just a person, or persons and their relationships, but pacts and kingdoms and systems beyond the everyday. As Leontes’ psychological issues lead him further into paranoia, his increasing unhinged state mirrors the unhinged nation state and the chaos of the world, culminating in a destabilising show-trial and the collapse of a set-piece to convey the distinction between the contrasting freedom of Bohemia. Now in 2018, Cheek By Jowl’s French company tours Pericles as Périclès, Prince de Tyr, marking Cheek By Jowl’s first French production of one of Shakespeare’s plays. It seems that director Declan Donnellan and designer Nick Ormerod (also the Artistic Directors of Cheek By Jowl) can’t shake the indelible psychodrama of Shakespeare’s “late plays”, for in Périclès they draw attention to the psychological frailty of Périclès and the trauma that his continued loss perpetrates on his consciousness. 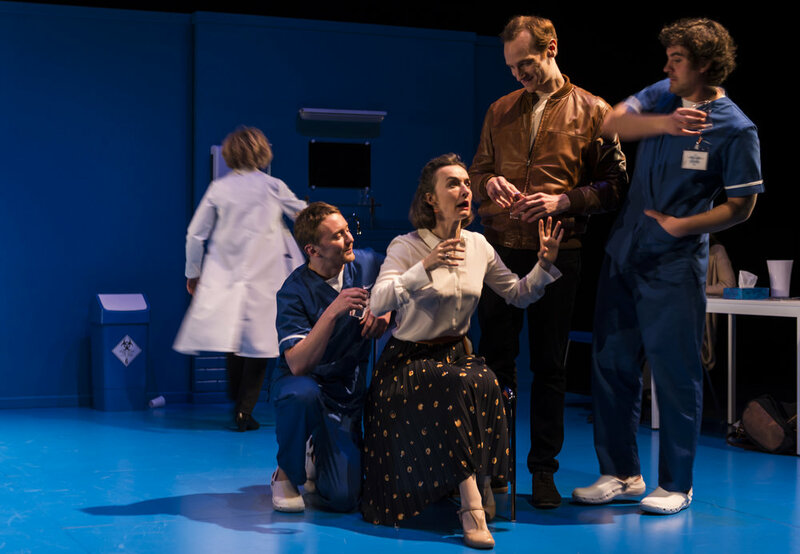 This production is set in a hospital room, a catatonic Périclès (Christophe Grégoire) present almost always on the stage. This framing narrative displaces and replaces the archaic Gower, and thus presents the life of Pericles as something more human than fiction. We first see Périclès prone, manoeuvred by a medical team, and then visited by what seems to be his family: wife, daughter and son-in-law. And then, as if the sound of roaring waves plunges us into his memory, we see the first scene of Pericles play out, Périclès in conversation with Antiochus (Xavier Boffier) played by the same actor who plays the son-in-law in the hospital room (who may or not be Lysimaque, whom this actor also plays). The scenes of Pericles play out in this fashion, with the doctors and Périclès’ family members – never changing costumes – taking the roles of others in flashback scenes. Périclès himself takes on two other roles, as Cleon and “Le Maître”, the man who runs the brothel – while this does complicate the nature of the narrative structure (more on this later), it does emphasise the fact that each actor plays not just the protagonists of the play but also its many antagonists, marring the lines between virtue and vice, a key theme throughout the play. And yet for all that, trauma is surely the zenith theme, shared by every character in this production. Thaïsa (Camille Cayol), having washed up on the shore at Ephesus, is so shaken by her experience that she pledges herself to Diana, turning away from her painful memory and supposed loss. Marina (Valentine Catzéflis), surviving continual attempts at debasement in the brothel, stays resolute, and turns to prayer and, more significantly, the conversion of others, such as both Lysimaque and Bout; her trauma is an opportunity to better not just her own life but the lives of those around her. Elsewhere, the doctor in the hospital (Cécile Leterme), who also plays the doctor aboard the ship (as well as Simonide, Cérimon, and Diane), is seemingly a minister to the traumatised, constantly appearing, as a doctor would, in places where she is able to facilitate some semblance of healing. The nurses (Guillaume Pottier and Martin Nikonoff) play fishermen, knights, and gentlemen, almost always treading a line between neutrality and assisting others. Trauma orbits Pericles and its characters, and in this production – from the cuts to the multirole casting – trauma is compacted and nuanced, sometimes repressed, sometimes dealt with, sometimes a force for good and sometimes bad, but rarely ever does it seem to be healed. The trauma that permeates Périclès/ Pericles cannot be reconciled until the trauma of Périclès/ Pericles is reconciled. What is most difficult about this production is the intentional ambiguity of its main characters: are we really watching the frail Périclès and his family, or is this some other man who is imagining that this was his life? If it is Périclès, are these flashbacks happening within his mind, detached from those around him? Or are these people performing with and for him, helping him to relive the trauma in order to cure it? As Périclès himself performs other roles, the identity of the man in the bed – and whether or not he is performing – is obscured. Much of the trauma of the play is imagined and therefore inherently psychological, as Pericles, Thaisa and Marina all live, despite the certainty they may have about each other’s deaths; highlighting the psychological effects of trauma which is self-inflicted by the psyche in the first place serves the depth of this production well. The man in the bed, Périclès or not, is traumatised by something that has happened to him; when the drama of the flashbacks has died down, he either slumps and stares blankly ahead, or else curls up and shrieks. He is straitjacketed at one point, sedated another. He does not talk to his visitors or to the doctor. Ostensibly it seems that, if this is Périclès, it is the Périclès on the ship off Mytilene in the fifth act, who having suffered too much loss with the supposed death of Marina, has receded into himself and talks to no one until, through Marina’s recollections, he is stirred to life. In this sense, performing the flashbacks to cure him is not a far cry from what actually happens within the play, where the shadowed past is brought to light by the revelation of truth and the reunion of family. This no doubt is troubled by the ending of this production, wherein Périclès, emotionally embracing wife and child, slumps once more, and is dragged to his bed by the nurses. This final scene is indistinguishable from the beginning of the play, as if no progress, medical or narrative, has been made. There are some other observations to be made about the production. As an English-speaker, watching a French-language production, in England, of a play written in (early modern) English by the most well known English playwright, nationhood and multiculturalism (and the timeliness of old art) immediately struck me as important concerns. This is a play about sea voyages, the threat and safety of borders, the pursuit of refuge, the ravages of famine. Performed in the age of Brexit and Trump – the age in which the United Kingdom bombs Syria, displacing its citizens while refusing to take in its refugees – the linguistic reclaiming of Shakespeare seemed not only a fitting choice but also an added layer of dramatic prowess. Further, Shakespeare’s play was significantly cut to facilitate not just the translation but also the framing device, though this was not done to its detriment: rather the production seemed at once fast-paced and yet suited to the play’s fractured, episodic composition. Confining the action of the play to a sea-blue hospital room was another strong choice, enforcing the psychodrama and the way that Périclès is trapped not just physically in his condition but also mentally, while also obscuring the lines between towns and nations and their peoples. The hospital room provides options for clear staging, from swinging doors conveying a storm to gurneys used for transporting people; a waiting room on the edge of stage left used sometimes to alienate those who are not present in flashbacks, and other times to convey the crossing of distance from Périclès and his bed to whoever or whatever is on the other side (such as Marina, towards the end of the first scene of act five). The lighting and sound were the best indicators of setting: fluorescent light and generic radio chatter located the action in the hospital room, strips of neon light cast the brothel in a sinful light, while the sound of breaking waves could signal being on the coast, and the mad flickering of lights and the sound of swelling wind conveyed the storm. Yet the sound was also inextricably tied with Périclès’ state of mind: vaguely modern techno music (accompanied by some provocative pseudo-strip-tease dancing) established the otherness of Pentapolis and his initial discomfort, while a more traditional, generic chanson of sorts (coupled with even more provocative, but much more reciprocal, dancing) established his comfort with Thaïsa. Every element of the production seemed to take consideration of Périclès’ mental state, and worked to establish, accentuate, or clarify it at that time. Regardless of what might be thought and written about some of the common themes (and shared insidiousness) of Shakespeare’s “late plays”, Cheek By Jowl find their own idiosyncratic way of exploring these links, not on Shakespeare’s terms or scholarly terms but on performative ones, perhaps as a result of Declan Donnellan’s work in The Actor and the Target. For surely these damaged, imperfect portrayals of Shakespeare’s characters are amongst the most believable, and thus even the wildest of plots can be made human, grounded as it is in psychological realism. It is ultimately unclear whether the man in the hospital bed has truly, personally endured these traumas; but it is undeniable that, psychologically, he has. Périclès, Prince de Tyr continues its run at the Barbican until 21 April 2018, and will transfer to the Oxford Playhouse from 24 – 28 April, after which it will tour to France, Spain and Italy in May and June. Information and tickets are available here. The production will also be live-streamed online, for free, on 19 April 2018. Photo posted to Instagram (@jayzaff) and Twitter (@TheAuthorIsDead). ‘Macbeth means Macbeth’: National Theatre, Royal Shakespeare Company, and "collective consciousness"